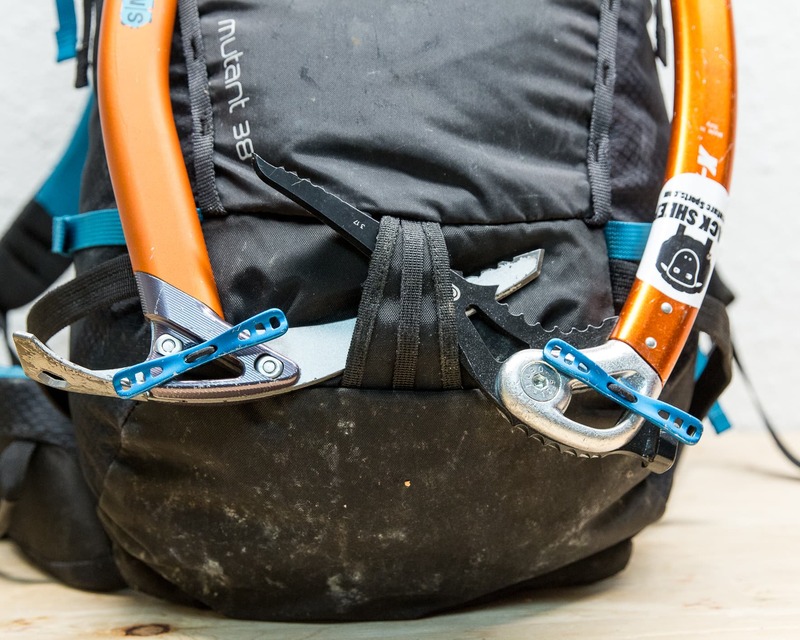 Osprey expanded and updated the popular Mutant pack into a line of climbing and mountaineering packs for 2018. This included the introduction of a new Mutant 22, an update to the Mutant 38 and the inclusion of a new Mutant 52 to replace the Variant 52. 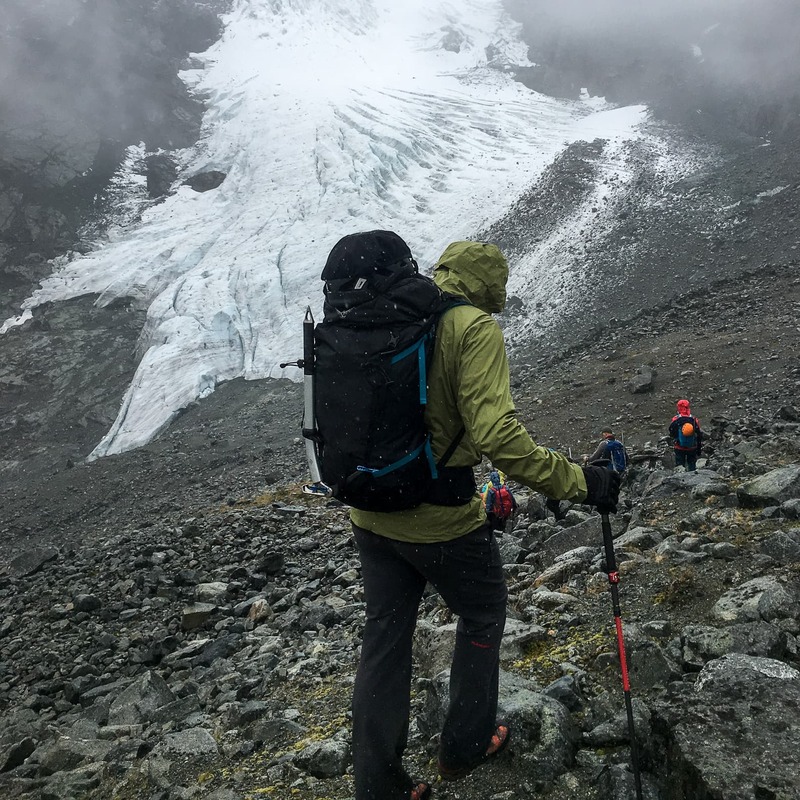 For this review we’ll focus on the Mutant 38, a great pack size for one day alpine and mountaineering missions. I hope to follow up with a review of the new 52 later in the season so stay tuned. If you’re curious about the previous version of the Mutant 38 check it out here. Testing out the Mutant 38 on a wet day in the alpine. In case your wondering about the color of the pack, it looks like the final production version of the pack is colored differently that the test version. Not an uncommon occurrence. The Osprey Mutant 38 packed up and ready to roll. I put a couple of different axes on it for a comparison. Daisy chains added along the back & top lid for attaching the helmet, etc. 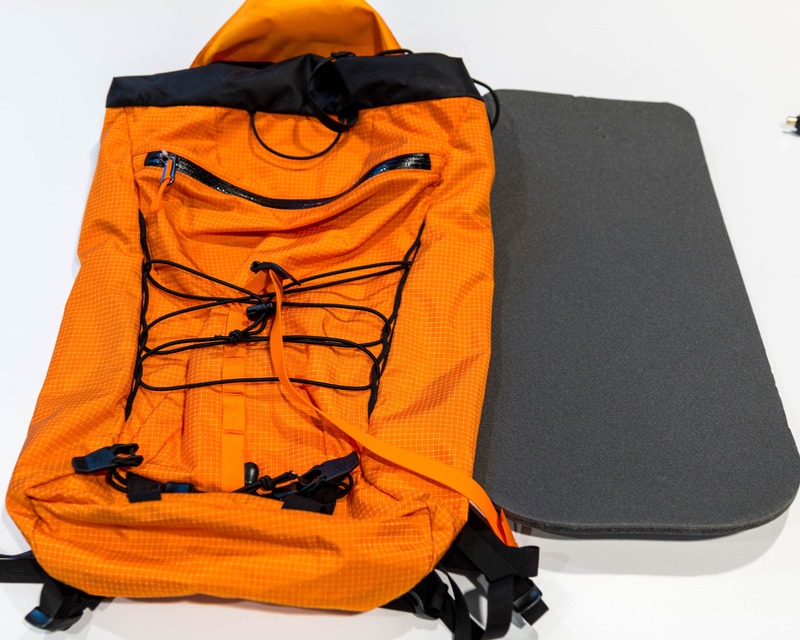 New daisy chain along the lid and the back are used with the helmet bra but can also be utilized to connect crampons to the outside of the pack, etc. 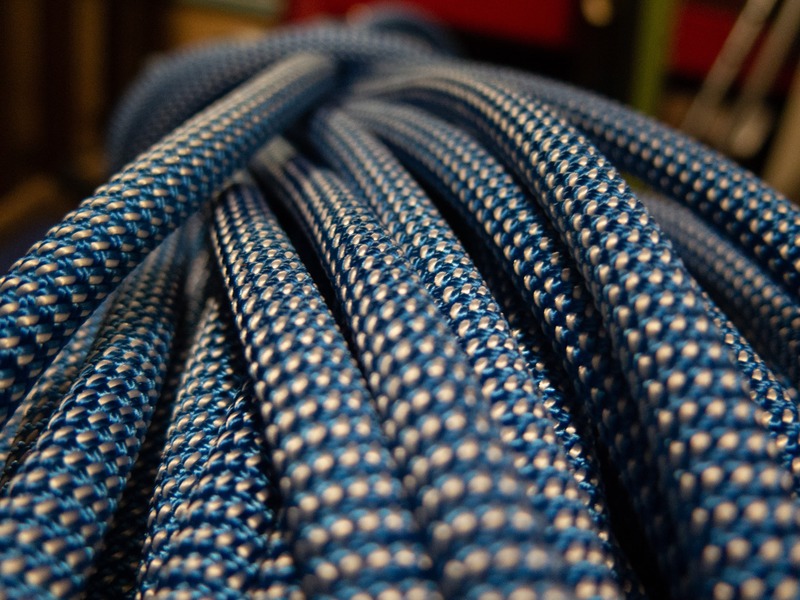 if some bungee cord is weaved through it like on the Alpha FL. The Mutant 38 has a functional though still fairly minimalist selection of pockets and storage. Starting at the top, the removable lid had a small storage pocket for the helmet holder. When deployed the helmet attachment system attaches to the top lid or the rear of the pack. The top lid also has a large storage pocket with a key clip. There’s no pocket on the underside of the lid. 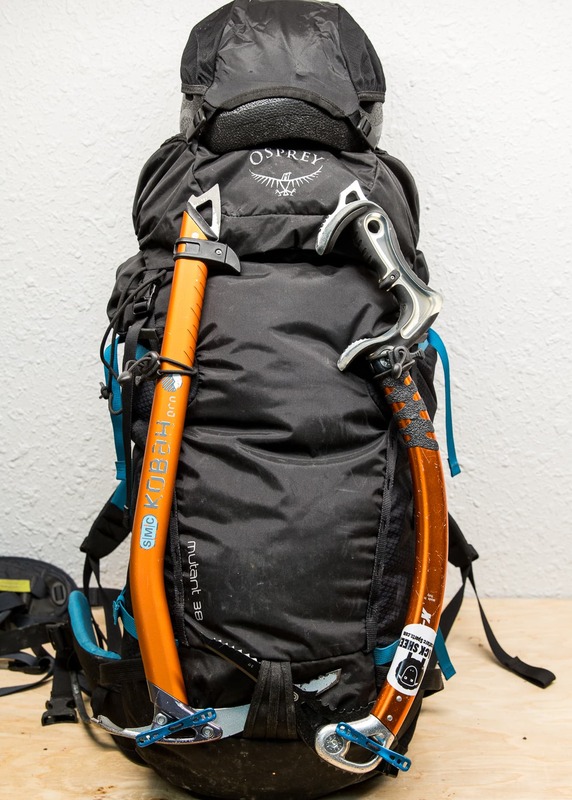 I’m surprised at the number of alpine climbing packs that don’t have a helmet attachment system. I always climb with a helmet and stuffing it inside the pack for approaches, etc. takes up a lot of room and can damage a nice lightweight helmet. Kudos to Osprey. Helmet mounted on the back of the pack instead of on top. A great option when bushwacking. 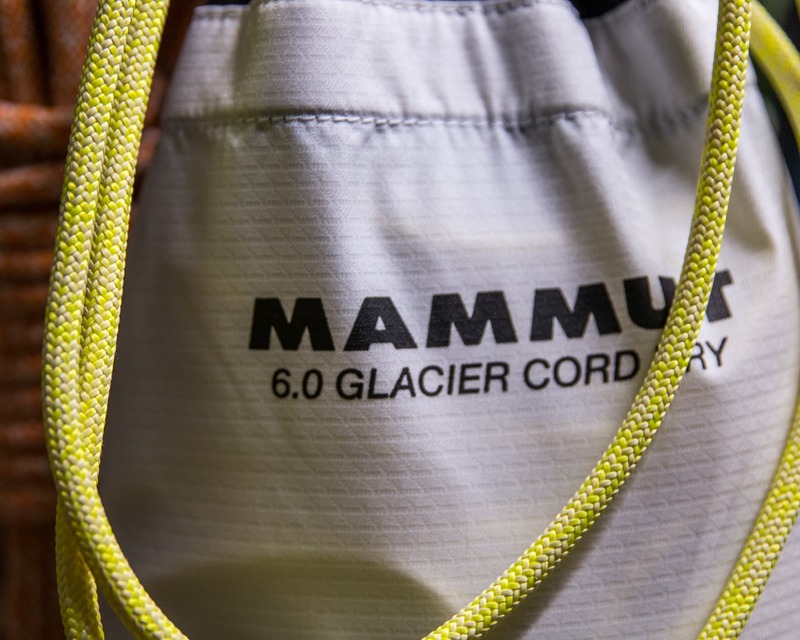 The main body of the pack has a draw-string closure with a small Flapjacket pocket built into it. When the top lid is removed this unique flap is deployed to create a low-profile and snag-free top. 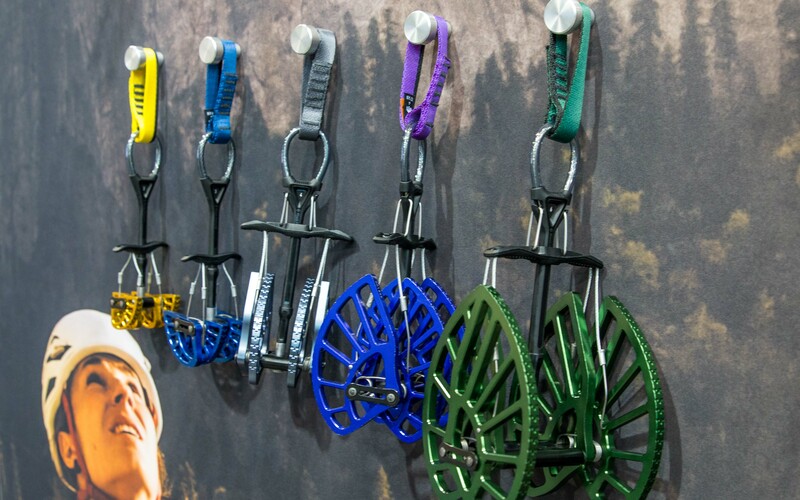 A great Osprey innovation! Inside the main body there’s a hydration sleeve and that’s about it. I really like the new Flapjacket design with the small storage pocket. 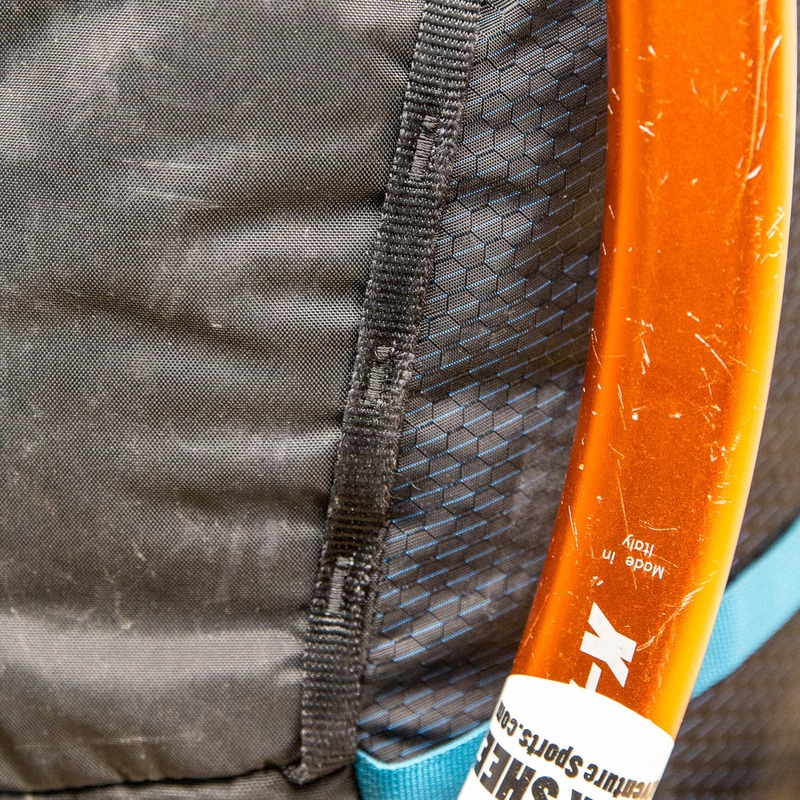 The outside of the pack has dual ice axe attachments that work well for technical tools and most mountaineering axes. 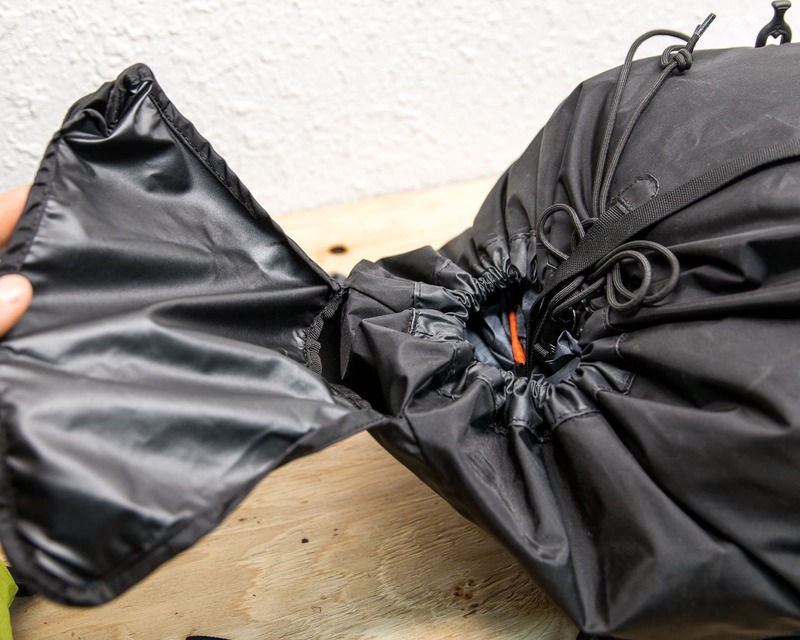 If just attaching a single axe the bungee clip can be a little loose as the single bungee cord goes through both. To solve the issue I would tighten the system by clipping the unused side through the daisy chain on the back of the pack. 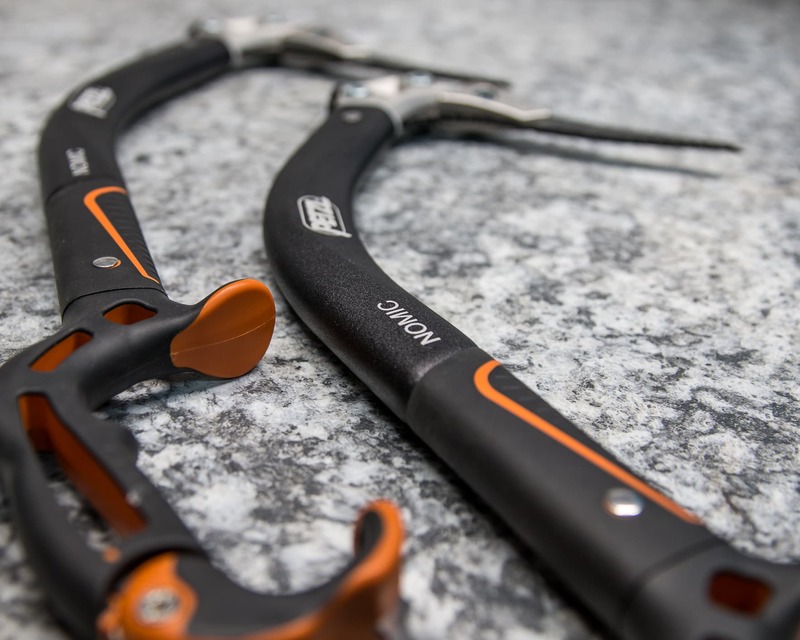 Ice tool attachment system work well with most technical tools and ice axes. The only axe that I’ve found doesn’t work with this style of attachment is the Corsa Nanotech due to the long cut-out in the pick. 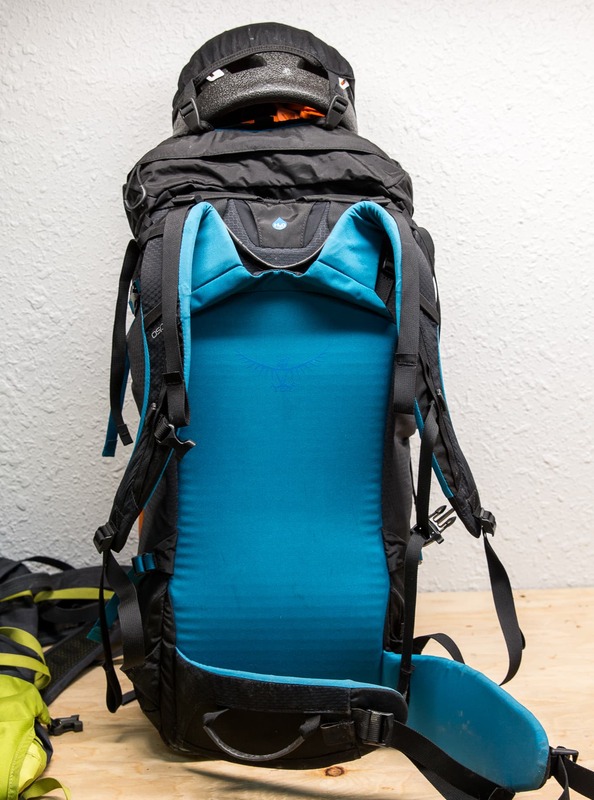 Blue side compression straps with a black A-Frame ski carry strap at the bottom. The side compression straps are nice simple straps. 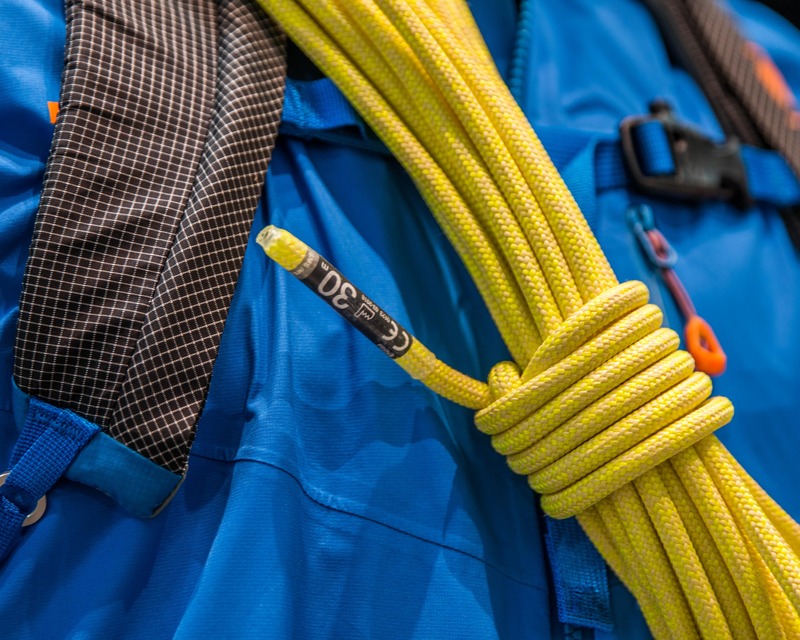 The top strap features a clip so it can be used for attaching a rope, etc. On my pack this top strap is also colored so as not to get mixed up with the black top-lid strap. The buckles are all black though. 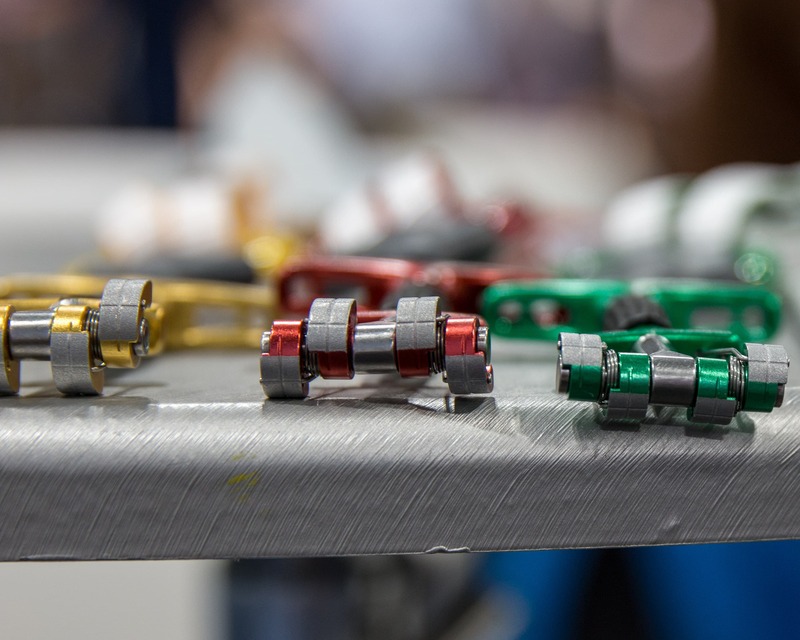 The production model that I saw on the Osprey website doesn’t seem to have followed this same color coding though. Instead the straps are all the same color. 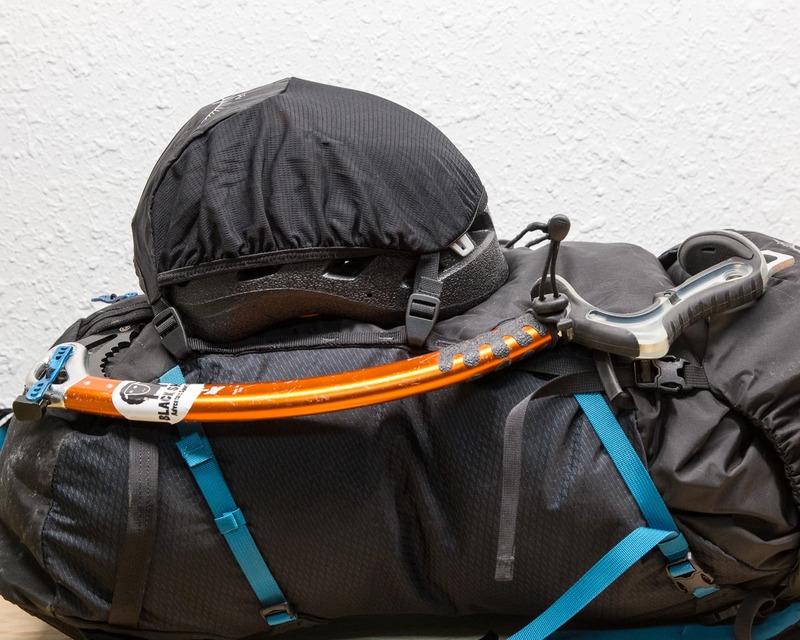 Lastly, there’s a reinforced A-frame ski carry strap, a common with these alpine climbing packs for some reason. The hip belt sports a couple of gear loops and ice clipper slots. 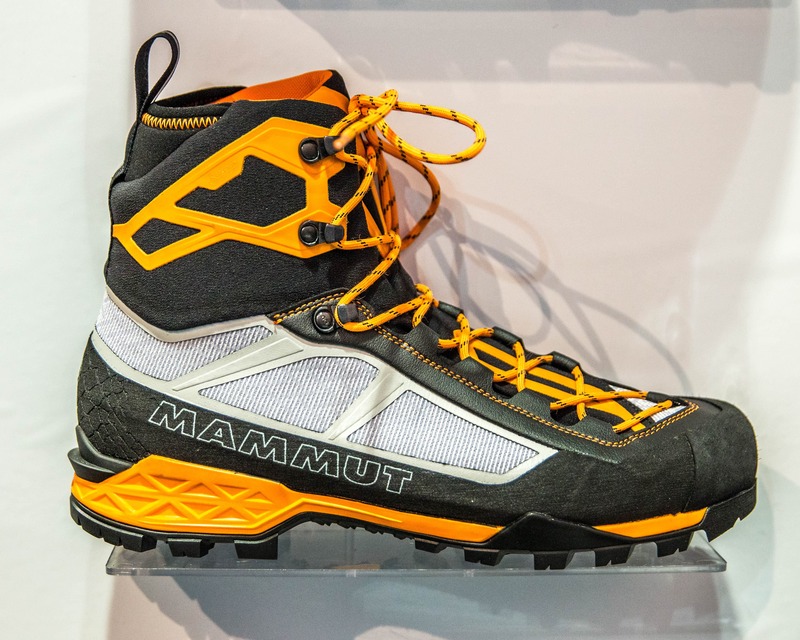 Ideal for glacier travel and easy mountaineering. 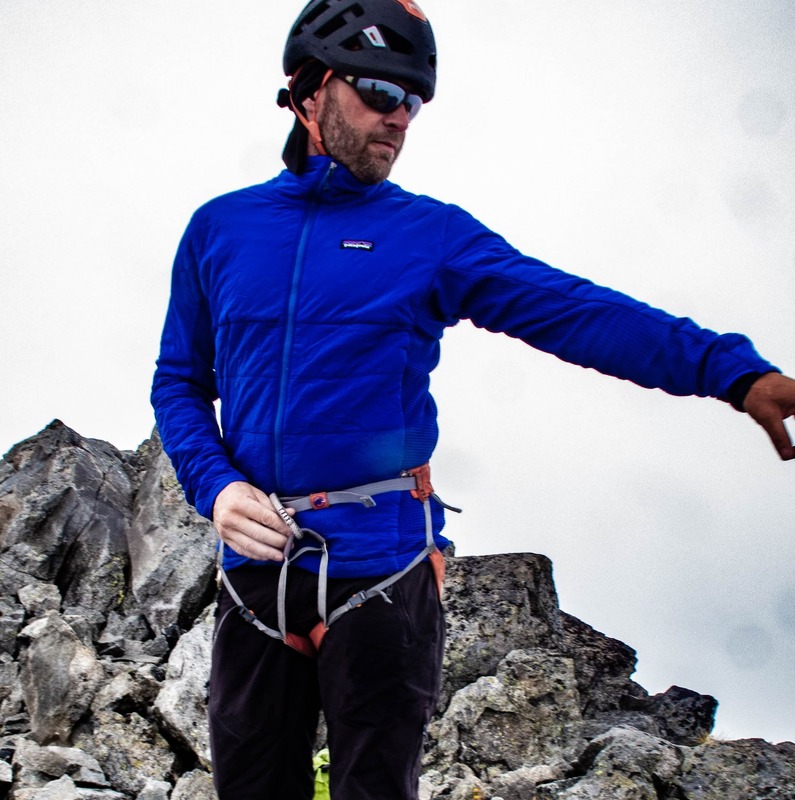 When the climbing gets technical I tend to clip the hip belt out of my way and use my harness. 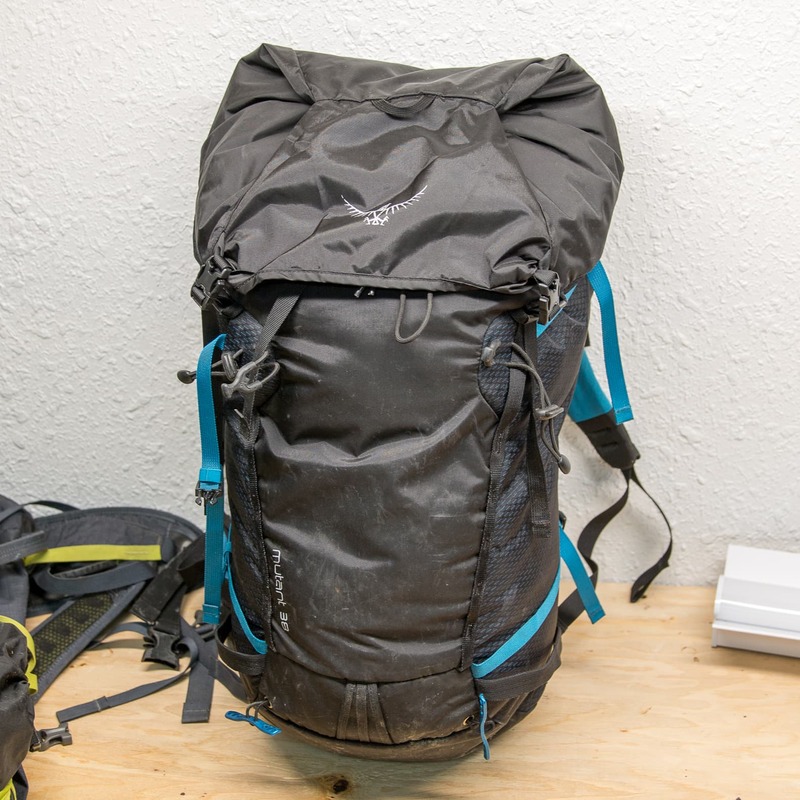 As expected with an Osprey pack, the new Mutant is incredibly comfortable to wear regardless of how much or little gear gets crammed in. 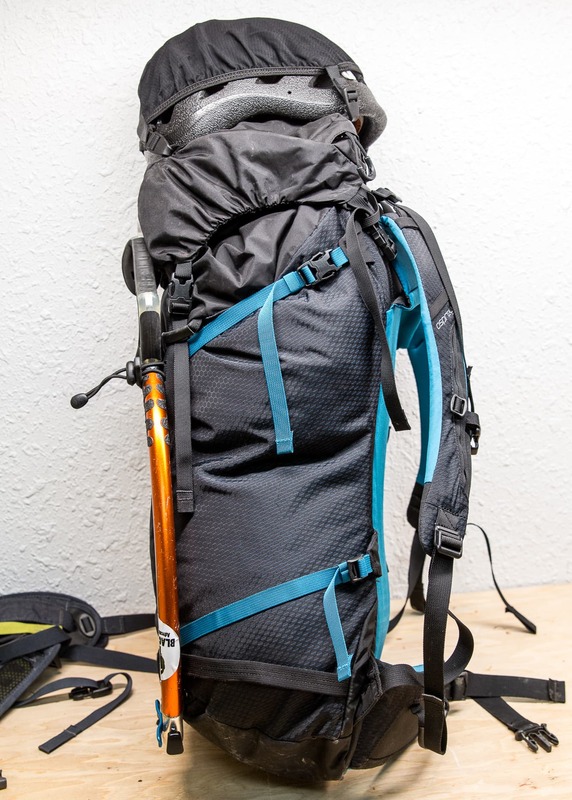 The hip belt and shoulder straps are nicely padded and the pack moves well with body. However, I do find that I have to loosen up the shoulder straps, lowering the pack or my helmet hits the lid when I look up. Rear view of the pack. 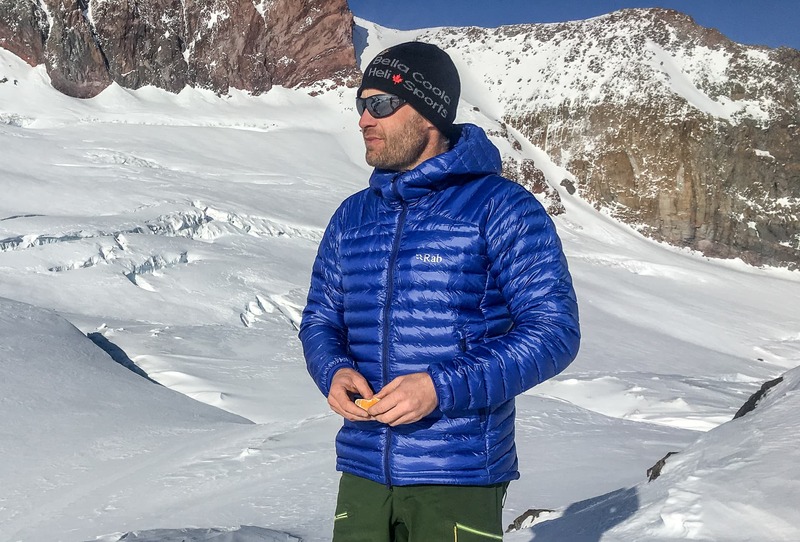 The new snow-shedding fabric along the packpanel is new to the 2018 version. Now I’ve only been using the Mutant 38 for about 30 days so far. This can make commenting on long-term durability difficult. 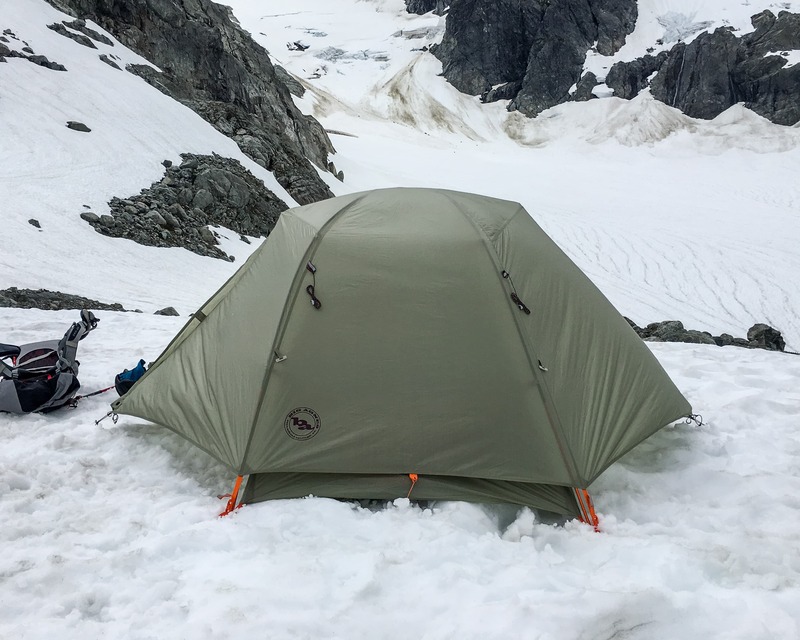 However, the test pack still looks pristine despite being schlepped around in the Canadian Rockies and the Coast Range mountains for the last few months. Also, the older version of the pack which was basically made of the same material had no durability issues outside the packpanel that’s been changed anyway. 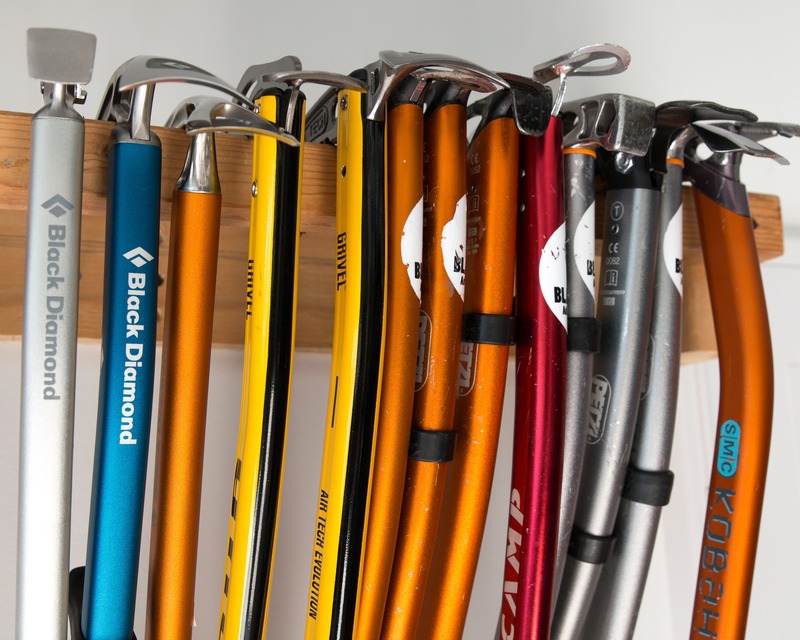 That being said there’s a little wear on the ice axe clipper bungee’s. Luckily they’re not all that hard to replace. One of the main issues I had with the Mutant 38 has to do with the attachment clips for the top lid. The clip and strap assembly on the backpanel side of the lid, used to detach it or adjust the height, have a tendency to come loose. The issue only occurs when the lid is full and flipped open to allow access the main compartment as shown in the photo. 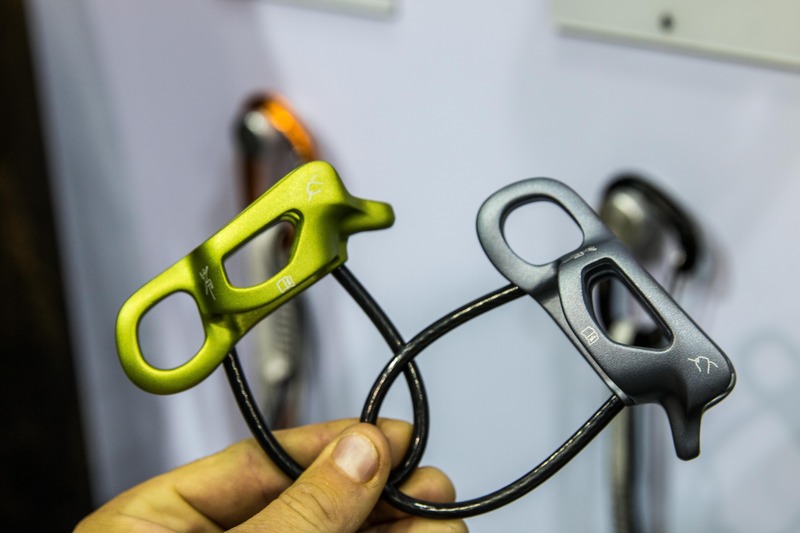 A clip with a strap tension lock could easily address the issue. 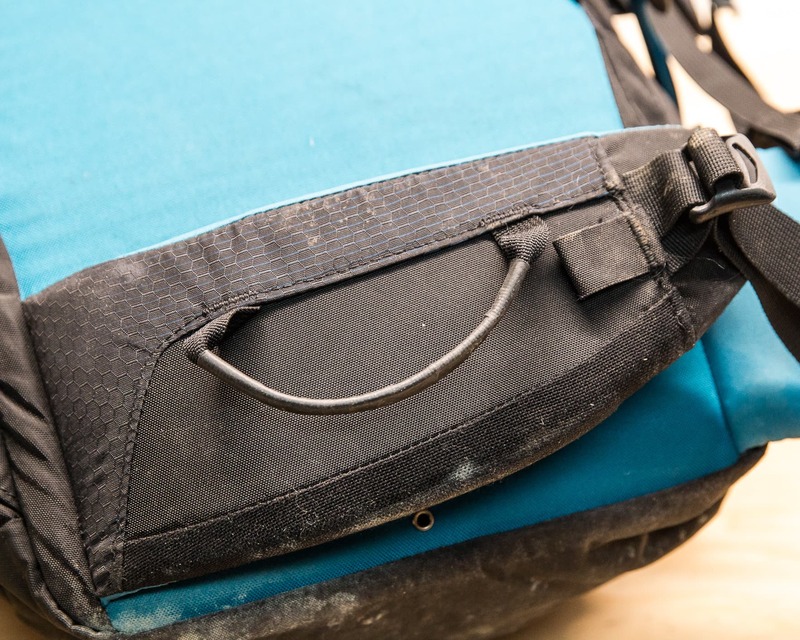 The straps on the back of the lid have a tendency to come loose when accessing gear in the main body if the lid is full. I really like the new packpanel on the Mutant 38. 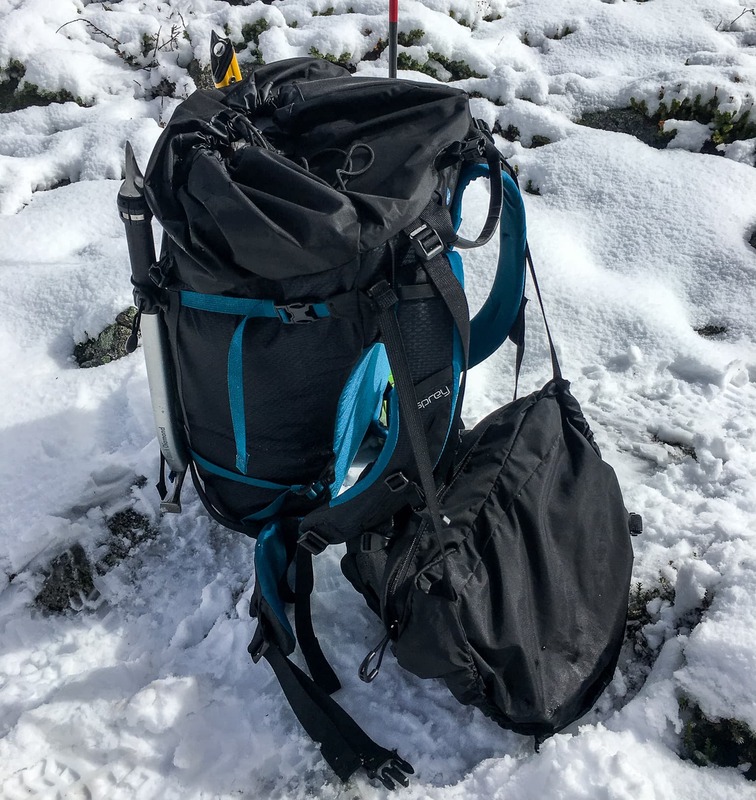 It’s always been a bit of a pet peeve when the lumbar area on a pack picks up snow when I’m stashing a jacket or grabbing a water bottle. 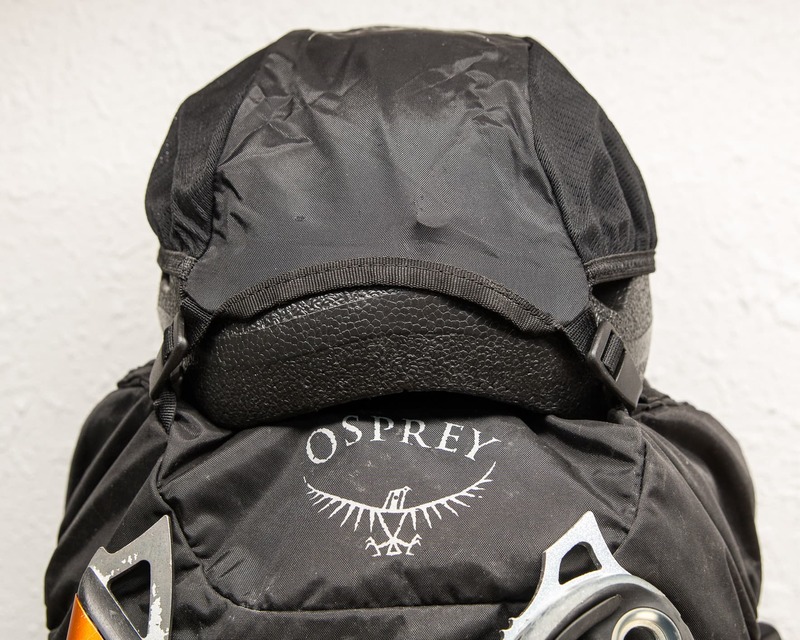 Needless to say, I was pleased to find that Osprey had added snow shedding fabric to the backpanel like most ski packs. Pros: Comfortable & versatile with an intuitive design. Cons: When the top-lid’s full the straps can come loose when accessing the main compartment. I’ve gotten really fond of side access zippers and would have liked to see one included. 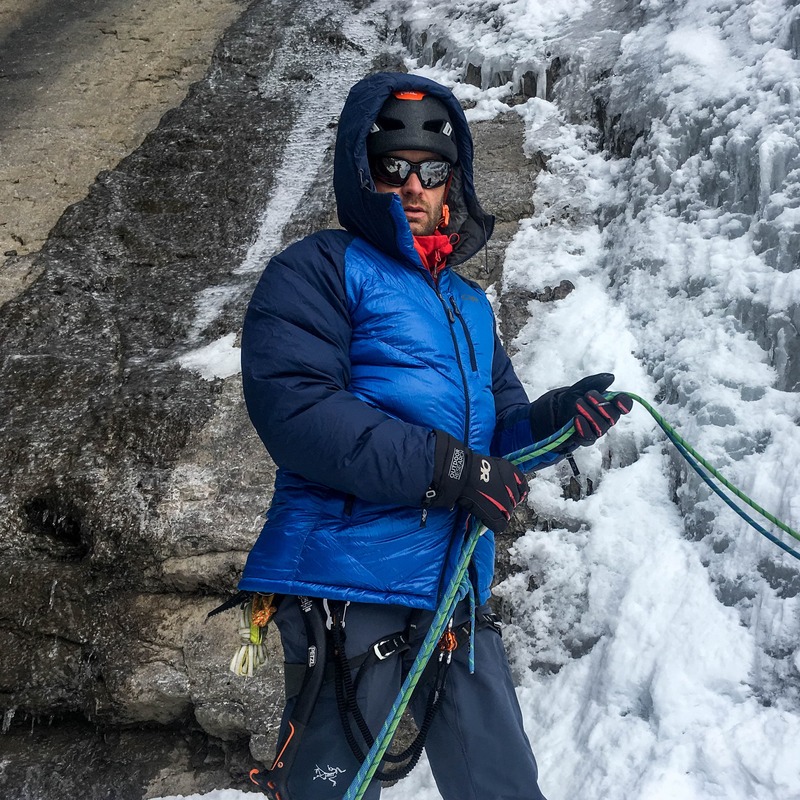 Overall: A well thought out, well featured and very comfortable alpine climbing, ice climbing, mountaineering and scrambling backpack. A personal go-to one to two day trips.